It’s that time of the year again: Apple introduces a new iPhone, and you have a big decision to make: Upgrade or keep your old phone? This year is no exception to the never-ending debate. The new iPhones — let’s call them the iPhone 6s and iPhone 6s Plus — have arrived. If you’re looking to upgrade, you might be ready to trade in your old iPhone. But how much is it worth? To find out, eHow.com went through 4 websites that buy used tech hardware: Best Buy, GameStop, Gazelle, and NextWorth. 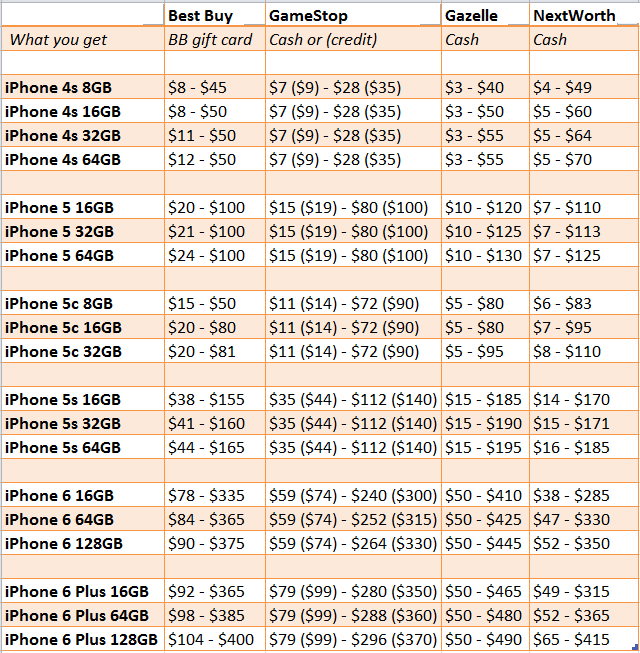 They compiled their findings in the chart below, which shows price ranges for 19 iPhone variants — from the the iPhone 4S 8GB through the iPhone 6 Plus 128GB. Not surprisingly, iPhones in mint condition — no scratches or cracks, all the cables and packaging in place — earn the big bucks. Broken phones may bring you a few bucks, depends on who buys it. Best Buy, for instance, won’t pay you a penny for a broken Phone, whereas Gazelle offers $50 for a busted iPhone 6 or iPhone 6 Plus that won’t turn on. Tip: According to a study done by online marketplace uSell.com, based on an analysis of iPhone 5S launch, your current iPhone will depreciate in value pretty quickly when that new model hits the market. So let’s face it! You might as well try auctioning it off on eBay or Craigslist. You have more control regarding your iPhone’s selling price there. Good luck with your search.